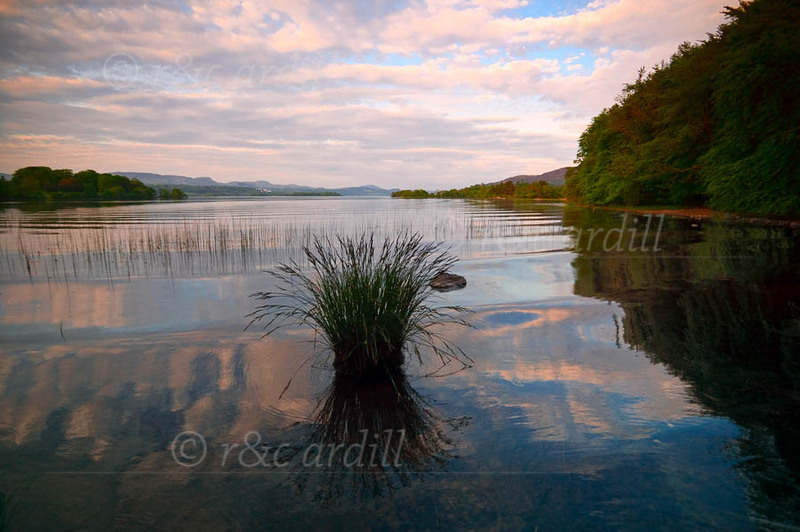 Photo of: West of Ireland: Sligo:Lough Gill. Lough Gill is a beautiful lake with the Garroge River running from it through Sligo town. It has some wonderful landmarks such as Inishfree island, immortalised in Yeat's poem 'The Lake Isle of Inisfree', and a splendid view of the 'Sleeping Warrior', which is made up of several peaks which are partly seen behind Church Island at the left of the picture. This photograph was taken at sunset looking east. A fishing boat had just gone by and its wake can be seen in the perfectly still lake. The lake has some wonderful reads and lush forrests surround it.